Video games and storage space have an antagonistic relationship with one another. More of one typically means less of another, especially on Xbox One where downloads average 35-50GB and the standard hard drive is only 500GB. And while it hasn't found a way to change the nature of the relationship, Microsoft has found a way to offer more storage to gamers thanks to its new first-party 2TB external hard drive, developed in a partnership with Seagate. Announced at Gamescom 2015, the upcoming disc drive comes in green, supports USB 3.0 and will work on both the Xbox One and Xbox 360. Besides the extra space, saving games to the external drive will allow you to take your catalog of games anywhere. 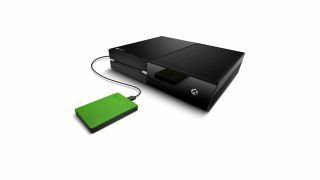 The Seagate Game Drive for Xbox (its official name) will be available first in the US for $110 from both GameStop and Amazon. Microsoft has yet to announce global pricing and availability, but we'll reach out for those details shortly.